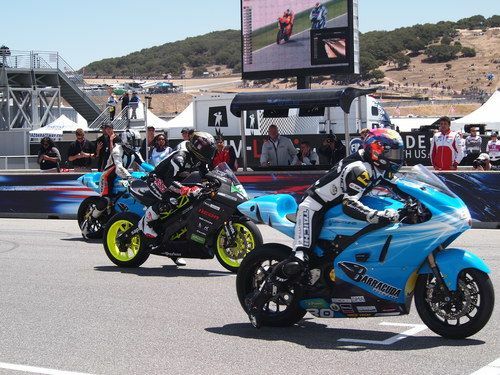 For the third year running, FIM's e-Power electric motorcycle racing series came to the MotoGP at Laguna Seca, with Barracuda Lightning Motorcycles and Icon Brammo winning. Barracuda Lightning and Icon Brammo took 1st, 2nd and 3rd positions on the podium yesterday at the third running of the FIM e-Power electric motorcycle race at Laguna Seca. The e-Power electric motorcycle racing series is a sort of cousin to the TTXGP, and this is the second year the that the e-Power and TTXGP organizations jointly run the Laguna Seca round. The race featured most of the top electric motorcycle teams from North America and Europe (it lacked both MotoCzysz and Mission Motors) and marked a huge leap forward such that the top electric motorcycles are now on the verge of 600cc gas superbike speeds and lap times. The weekend featured fine weather, with high temperatures around 70 degrees due to the typically cool California coast weather. Yesterdays race was delayed by 2 hours due to another typical feature of California coast weather, fog. By race time at 12:20 the weather was clear and warm. The race started with the typical Michael Barnes zoom from the starting line. He does this every time, even from the back of the pack, thanks the powerful machines Lightning Motorcycles builds. He led the race riding the Barracuda Lightning #80 giving very consistent 1:35-1:37 lap times. His best lap time, 1:35.319, was not fast enough to beat the 1:31 best lap time by Mission Motors last year, so that track record still stands. However Barnes' best lap time on Saturday, 1:33.860, put the team within striking distance of beating the Mission Motors record. Saturdays laptime was fast enough to place 24th in yesterdays 600cc superbike qualifying race, out of a pack of 27 bikes. Barnes feels the bike can go even faster, however he may have been holding back on the throttle to leave power in reserve in case 2nd place finisher Steve Atlas presented a challenge. In the post race interview, Barnes talking about the need to manage the power on his bike said: “it’s a real temptation; but to just be on the throttle and go as fast as you can all the time is not a winning strategy. We are hoping with advances in battery technology, we will achieve the next step, lighter packs that hold more energy so before long we will be in the super bike distance races...” In case it's not clear, the Barracuda Lightning team has in their sights developing an electric motorcycle that can race at both the speed and distance of the 600cc superbikes. Coming in 2nd was Steve Atlas on the Icon Bramo Empulse RR. His bike had a problem in Saturday's qualifying round meaning he didn't have much track time before the race. But that didn't stop him from a very strong 2nd place showing. His lap times were a very consistent 1:35-1:36 with a best lap time of 1:35.625, oh so close to Barnes time. Atlas also finished just 2.903 seconds behind Barnes. Atlas also has the 600cc superbikes in his sights, saying "Once the battery technology catches up we will give the gas bikes a run for their money." In 3rd place was teammate Eric Bostrom, new to the Icon Brammo team. Even though he has just a week of experience with electric motorcycles and the Empulse RR, his lap times were just behind Atlas in the 1:36-1:37 range, and a best lap time of 1:36.259. In the post race interview he said his biggest disappointment was being unable to push Barnes very hard, and he finished 12.798 seconds behind Barnes. In 4th place was Matthias Himmelmann of Meunch Racing from Germany. In European electric motorcycle racing, whether it is e-Power or TTXGP, it is Meunch who wins most often. Himmelman had very consistent 1:37 laptimes with his fastest lap at 1:37.246, and finishing a very respectable 16.325 seconds behind Barnes. Despite this Himmelman was disappointed with the result. A contributing factor is that the bikes ridden by Himmelman and teammate Katja Poensgen were new designs, which the team is still developing and refining the setup. In 5th place was Michael Barnes teammate in Barracuda Lightning, Tom Montano. His lap times were not very consistent, largely between 1:37-1:39 with his fastest lap time at 1:37.681. He 1:00.982 behind Barnes. In 6th place was Katja Poensgen of Meunch Racing. Following a rough start she had consistent lap times of 1:50-1:51 with the fastest at 1:50.163. This was quite a bit slower than Himmelman's times, and she finished one lap down from Michael Barnes. After saturday's qualifying round several of the riders/bikes in the grid were shown on the race results sheet to not qualify for the race. This was due to rules being followed within the e-Power series requiring the riders/bikes to qualify with lap times above a certain threshold speed determined by the fastest qualifier. An arrangement was made allowing all the riders & bikes to race, and they did. Robert Hancock riding for the Virginia Tech team, and Ely Schless of Protomoto, were duking it out for 7th place most of the race, with Schless generally getting the better of Hancock. However, Schless had a battery pack that didn't hold quite enough kilowatt-hours to last for the whole race, and his bike pooped out on the last lap. Hancock's best lap time was 1:56.311 and he finished one lap down from Barnes. Kenyon Kluge and Ted Rich, both riding for Zero Motorcycles, were very evenly matched due to riding identical bikes, and were duking it out for 8th and 9th place. Kluge's best lap time was 2:02.118 and Rich's was 2:02.137. Jeremiah Johnson of BE-EV.com riding a Zero S, loaned to him by Zero Motorcycles, pulled up the rear, finishing two laps down from Barnes, with a best lap time of 2:03.760. He had never ridden a Zero S before yesterday, meaning he was still learning the ropes of the bike. Lightning Motorcycles has long wanted to win this race, only to be beaten by Mission Motorcycles and MotoCzysz in previous years. In both 2010 and 2011, MotoCzysz beat Lightning Motors by a nose, however both were beat soundly by Mission Motors that year. Neither MotoCzysz nor Mission took part this year, so one wonders what might have happened had they come. In early June, MotoCzysz broke the 100 miles/hr threshold at the TT ZERO. In June, Brammo won the Portland round of the TTXGP after MotoCzysz pulled out. In early July, Brammo came to Laguna Seca for the REFUEL race, with Steve Atlas achieving a 1:40.269 lap time. Each year of the Laguna Seca e-Power race has concretely demonstrated a large leap forward in electric motorcycle technology. 2011 was the first year a bike, Mission Motors, ran at the speeds of the 600cc superbikes. This year there was a different bike, Lightning's, to do the same, and the bikes from Brammo and Meunch were oh so close to doing the same. Overall the electric motorcycle racing scene aims to achieve parity with gasoline powered motorcycles, as both Barnes and Atlas said following the race. The two dimensions of this are speed and total race length. This year we are seeing motorcycles from three teams with speeds at or close to the 600cc superbikes, and it's clear that closing the speed gap is simply a matter of time and refining the setup of each bike. What will close the race length gap is a breakthrough in battery technology that would increase energy density, allowing an electric motorcycle to carry more kilowatt-hours of electricity. Battery researchers around the world are working on just such a breakthrough, for example Envia Systems in February announced technology that would give over twice todays energy density at 1/4 the cost. When (not "if") electric motorcycles are able to run at the same speed and race distance as the 600cc superbikes, what need will there be to burn gasoline to hold a motorcycle race?